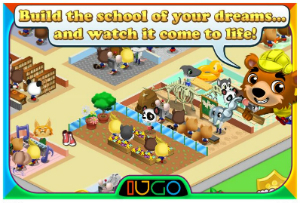 IUGO is pleased to announce the launch of its next mobile social title, Animal Academy, a time/resource-management game that lets you build and customize your school for adorable animal teachers and students. “We wanted to create a fun experience for all ages,” states IUGO’s CEO Hong-Yee Wong. “Animal Academy is very easy to pick up, and the friendly and intuitive activities will keep you delighted for hours.” The game launches with 20 cheery classroom themes and 23 endearing animal characters, with more being added with regular updates. Customize your school – Build classrooms that will delight the students of Animal Academy. Reading, writing and arithmetic are the basics, but this ultra-fun school can also teach subjects such as paleontology, robotics, fashion and football to name but a few. Attract adorable animals – Each new classroom unlocks a new animal species! Cats, dogs, penguins, foxes, robo-mice and more. Play with friends – Pitch your students up against rival schools in friendly competitions or help out by supervising a friend’s classroom! Playing with friends earns you daily in-game rewards. Play the role of Principal – Build and maintain the greatest school in the land. The students at Animal Academy have been known to reward beloved Principals with heart-felt, home-made gifts. Expect tons of future content – IUGO is committed to keeping Animal Academy fresh with frequent and continuous updates. Check back often for new classrooms, animal species, game features and more. The iPhone and iPad enhanced game is available now in the Apple Appstore and is today’s free download thanks to @FreeAppADay. Animal Academy is rated 4+ and is compatible with iPhone, iPod touch and iPad devices running iOS 3.0 or later. This entry was posted on Wednesday, August 24th, 2011 at 12:52 pm and is filed under Casual, Educational, Everyone, Mobile, National News, New Releases, Simulations. You can follow any responses to this entry through the RSS 2.0 feed. You can leave a response, or trackback from your own site.